The Three Aksha Dance Ensemble performed their home season along with musicians from India, Europe and UK on the 28th and 29th of June 2013 at Painted Bride Art Center, Philadelphia, PA. All 40 performers were disciples of Viji Rao at the Three Aksha Institute, which specializes in Kalakshetra style of Bharatanatyam. Season consisted of Three Aksha presenting a triple bill of Pushkara, Saha and Aarambha. Musicians Ajay Warriar on vocal, Bhavani Shankar from UK on mridangam and Thevaraj from France on violin brought a distinguished flavor to the concert. I witnessed this performance, dancers blew my mind off. They were so very well coordinated and choreography by the artistic director Viji Rao was extremely good. 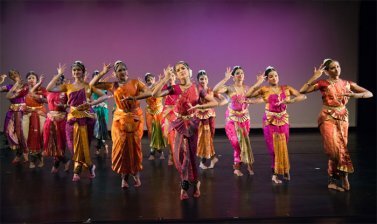 One should witness Three Aksha to see the talents from U.S.A. in Bharatanatyam idem. Leave a reply on "Lively performance by Three Aksha Dance Ensemble"